West End Dumplings: James Stuart Electrifies Winnipeg ! James Stuart Electrifies Winnipeg ! 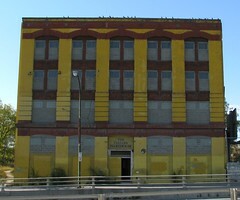 This post is a 'prequel' to my post about the circa 1909 Stewart Machinery Building / Yellow Warehouse at 764 Main Street. James Stuart is considered one of Manitoba's 'fathers of electrification'. The Scottish immigrant settled initially in Toronto where he had a senior role in the planning and running of a gas plant in that city. He worked his way up to Vice President of Consumers' Gas Company. 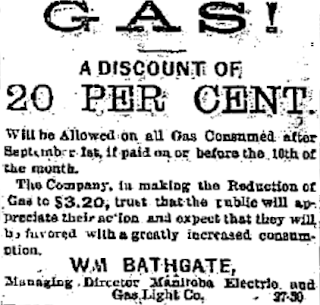 In 1882 he, along with wife Kate, were wooed to Winnipeg by the newly formed Manitoba Electric Gas and Light Company. It was a private firm established to build a similar gas plant for Winnipeg and to try to get an early foothold in supplying electric lighting to the streets of Winnipeg. Once the gas works were up and running, Stuart became the manager. 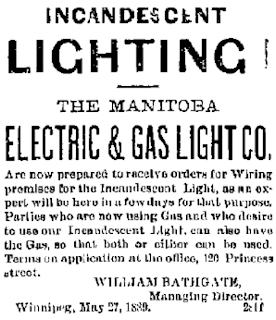 The year Stuart signed on with Manitoba Electric was also the year that Winnipeg had its first demonstration of electric arc lights: four street lamps installed around the city by an American firm on a demonstration basis. Stuart's company wanted in on the scheme and created their own lighting demonstration. 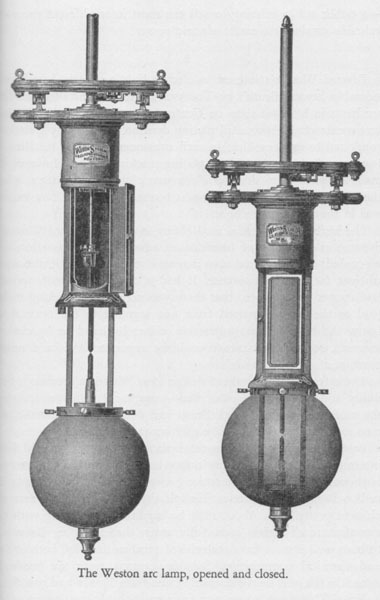 In January 1883 they supplied a limited number of street lamps along Main Street using Weston Electric Arc lamps. 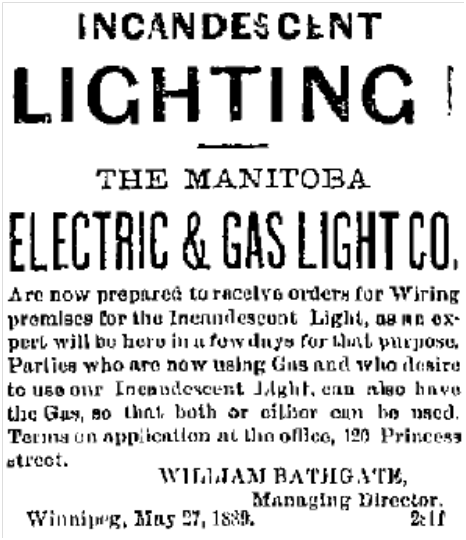 In 1889 Manitoba Electric took the program to a whole new level: electric light services for private buildings and residences. 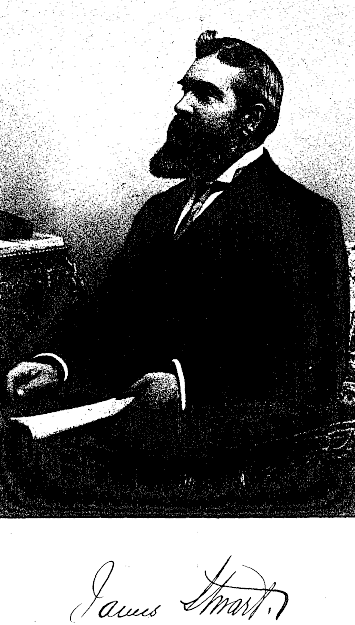 Stuart's name appears in the papers as a part of company delegations working out issues with the city such as the placement of electricity polls. 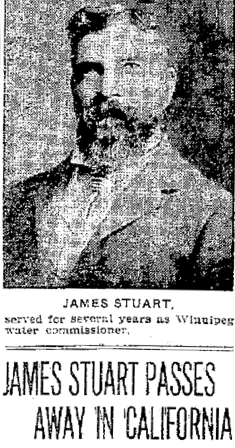 During the 1890s Manitoba Electric merged with the Winnipeg Electric Street Railway Company and Stuart's role was expanded to be the manager of the gas works and the electric light works. In 1899, Stuart left the electric company to become the city's first Water and Light Commissioner and it would be a busy first year. To this point the city water system had been a private affair using river water and a number of small wells around the city. 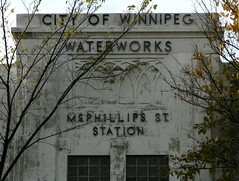 In 1899 the city took over responsibility for the waterworks and a new water plant and reservoir, relying solely on well water, was being constructed at McPhillips and Logan. With it came the planning and installation of dozens of miles of new water mains. As for electricity, there was planning for a future electric plant and in hundreds of new lamp poles erected on city streets that year. 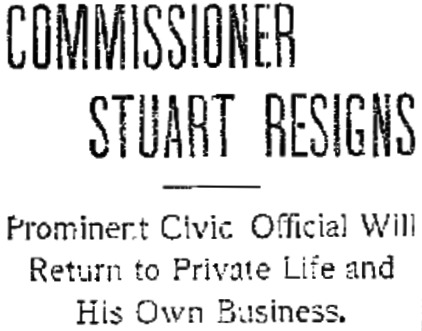 In 1901 Stuart took a six week long vacation, his first since becoming commissioner. Aside from a trip to the U.S. to visit water and electric plants, he also took care of his personal life. While on vacation ads began to appear for the Arbuthnot and Stuart Machinery Company. 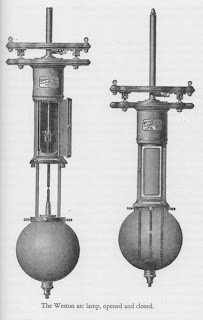 James Stuart and newly elected mayor and lumber magnate John Arbuthnot teamed up to create a company that specialized in the sale of new and used industrial machinery such as pumps and generators. It was located in an unassuming, two storey, 40 x 132, tin clad building just meters north of the CPR main line on Main Street - the forerunner to the present day 764 Main. 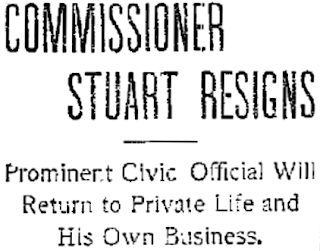 In October 1902 Stuart tendered his resignation as commissioner, ironically, to his business partner and mayor John Arbuthnot. Stuart said that he wanted to concentrate on private business again. 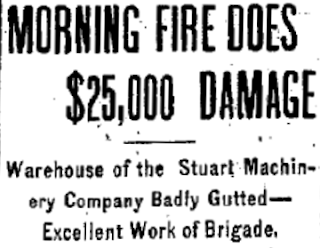 In 1902 the Stuart Machine building underwent a major expansion. Rather than just sell machinery, they could now package and ship to site the complete machinery package for a lumber mill works (such as for Kootenay, B.C.) to for a small electric light generating plant (as with Selkirk, MB). 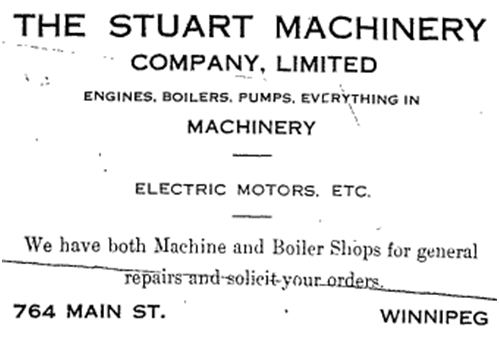 The following year Stuart bought out Arbuthnot and it was renamed the Stuart Machinery Company. Stuart saw an additional business opportunity 1903. 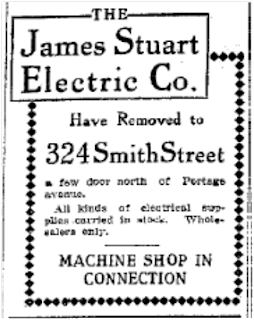 He purchased the stock and Princess Street building of Miller Morse, a failed electrical wholesaler and renamed it the James Stuart Electrical Company. 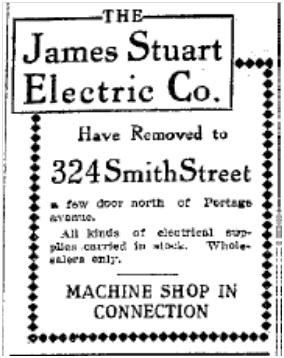 One biographical sketch said that he sold his interest in Stuart Machinery to buy the new company, he did not. 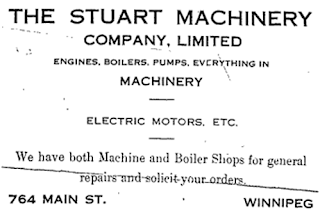 Stuart Machinery was an innovative company, often participating in high profile demonstrations at their building or at the city's industrial fairs and exhibitions. In 1909, Stuart's building at 764 Main was hit by a devastating fire. Newspapers pointed out, with some surprise, that the part of the building was due to high water pressure fire hydrants located out front. Why the surprise ? the North side of Main Street was not yet inside the "high pressure zone". Someone (perhaps a former water commissioner ?!) had the high pressure line extended 300 feet beyond the boundary, just enough to include the block that the Stuart Machinery building was on ! (Newspapers, though, don't seem to have connected the two). Stuart Machinery rebuilt bigger and better on the same site. In February 1910 the new building opened. Stuart did not stay in business much longer. In 1912-13 he sold off his business interests, (he also held the majority of stock in the Selkirk Electric Light Company), and retired to the U.S..
Stuart died in 1925 at the age of 72. He was predeceased by his wife and survived by their five children. - Early electrification in Manitoba and at MHS. An electric post! Seriously though, much appreciated this overview of early electrification in Winnipeg. Too often the stories behind the introduction of such crucial services are overlooked. By placing them in context you allow us to better understand the historic pace of development in Winnipeg. BTW, do you happen to know which Winnipeg residential structures were the first to be built from the ground up with electricity as part of the blueprints? I don't offhand but while researching sometimes come across 'one of the first houses in Winnipeg with electric lights' I will keep an eye out in future. It would have been along Main Street and area that was first to be electrified so I would imagine it would have been houses that were once on the exchange district that would have been wired up first - around where Kelly House is now. I have just come across my Great Grandfather's Obit, William Barton, (unfortunately no dates mentioned) but there was mention of his position in Electric Motor Sales with James Stuart Electric Co.So thanks for this site....interesting bit of history for me.